As promised, here is the tutorial! I started out with a flower box that I found in my parent's garage and then bought a few other miscellaneous wood pieces from Lowes. All in all I spent less than $10 on wood, making this a very affordable project. It was extremely simple friends, so don't be intimidated by the the need for a saw and a drill. I have no real wood working training and I was able to put the whole thing together during my daughters' nap on Saturday. 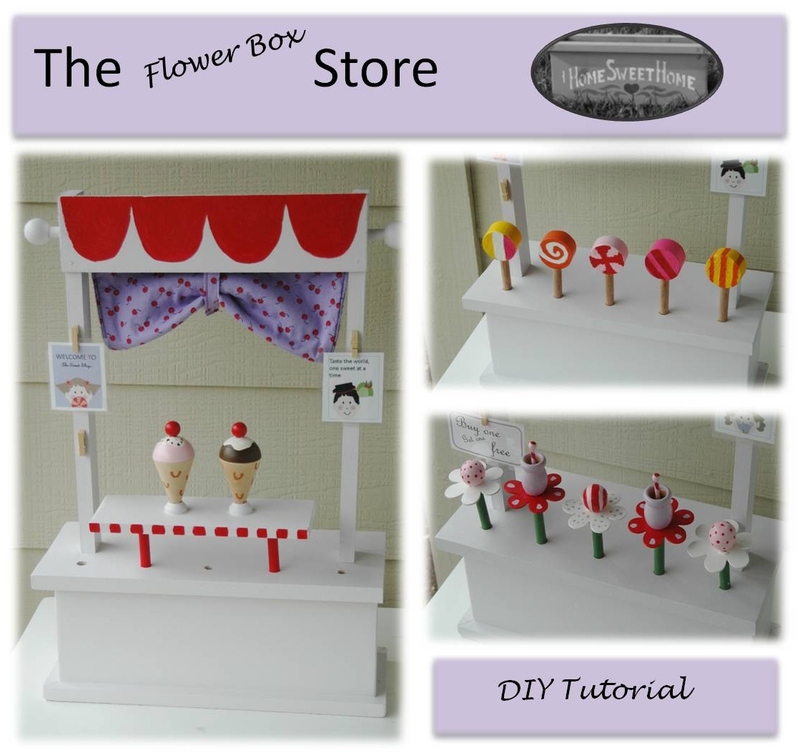 Since the size of your store will depend entirely on your flower box (or you could make your own flower box base), I'm just going to focus on the process of making the store rather than the actual measurements. I apologize for the pictures. I was trying to be sneaky when I made this so I took all of my pictures on the side of the house. Lu definitely knew something was up and feared she'd try to peak when she was supposed to be sleeping. Here are my wood pieces before cutting. I used Poplar wood. First, turn the flower box upside down. Then measure the counter top and cut it so that it has a little overhang over the box. Don't attach it yet. Also cut your side poles to the height you want. You are going to want to build the whole top of the store before you attach it on to the flower box base. Mark where you want the side poles to be attached to and start to drill a hole on the the back side of the counter top. You don't want it to go all of the way through, only a little bit. This just provides a grove so that the wood screw head will fall below the surface of the counter. Drill a hole through each of the side poles. Ideally you might want to do this before you attach it to the base, but I wasn't thinking ahead, so I did mine after. Put the dowel through and glue on the caps. Then nail on the front piece which you have cut to perfectly cover the side rails. Your top is done! Use wood glue and screws to attach the top to the base. Then drill holes (don't go all the way through!) to hold your accessories. You can read all about all of my accessories here. Here is a picture with all of my flowers attached. Paint and you are done! Not too hard, right?